The Biennial Consultation on Urban Ministry creates space and spaces to read again the city, reimagine alternatives and recommit as community to live justice together and create cities of peace for all people. This deliberately urban conversation for over twenty-two years has been sustained by the driving value to see and celebrate the incarnations of God among unexpected places and excluded peoples. Different knowledges and experiences have been brought to light and listened to as the Consultation gave attention to the vulnerabilities and possibilities in the City of Tshwane/Pretoria, the executive capital of South Africa. This dynamic urban context continues to cultivate new theological questions and liberating actions through ongoing discernment and critical engagement with faith, the church and community-based initiatives in the (post)apartheid city. South Africa’s history of disciplined resistance and protest caused the law of apartheid to fall. The organised majority forged ahead slowly, yet steadily in the ongoing struggle for justice. Today, a new generation of activists continues the struggle to disarm the looming spirit of apartheid embedded within education, politics, the economy and even the church. The struggle for a just community, a just city, a just country and a just world takes courageous daily engagement and creative strategies for building coalitions with people of good faith and good will to act collectively and subvert power imbalances. celebrate the urban alternatives organising from below and within. The 12th Biennial Consultation on Urban Ministry welcomes urban practitioners, pastors, faith-rooted activists, academics, students, and inhabitants for reflection, information sharing, fellowship and reinvigoration. We plan to gather 500 people from 5 continents, transcending geographical, socio-economic, political, denominational, generational, gender, racial, ethnic and language lines. Committed to love the city and draw from God’s abundance in the city, the hosting of the Consultation embodies partnership. Led by the Institute for Urban Ministry, the Consultation is collectively hosted by Tshwane Leadership Foundation, Resonate Global Mission, Echo Youth Development, Servant Partners, Lead4Christ, the Centre for Contextual Ministry at the University of Pretoria, and the Chance2Advance Programme and Department of Spirituality, Missiology and Church History at UNISA. 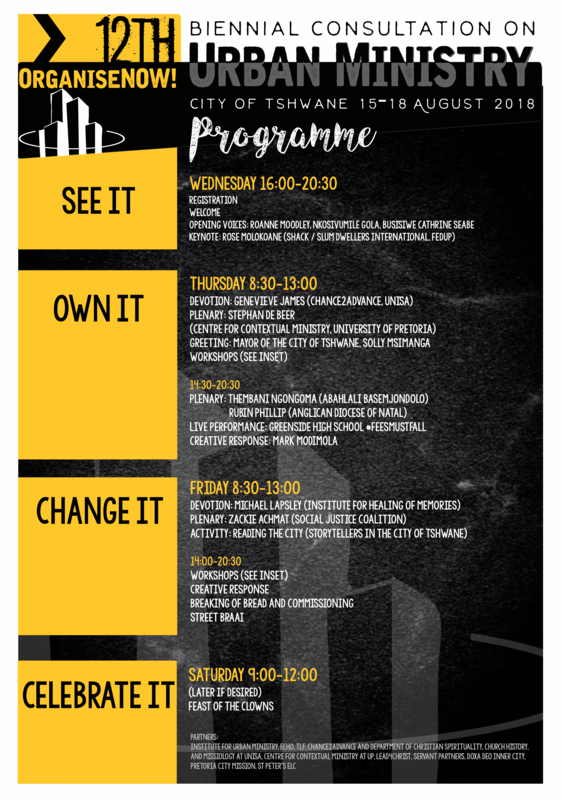 The Consultation will take place within the 10 Days of Justice and flow with the Feast@UP (University of Pretoria) and the Feast of the Clowns, an inner city community festival celebrating arts and justice, God in the city and the city’s diversity. As a festival of justice and reconciliation, it seeks to heal, dream and confront, all at the same time. Organise! will culminate on Saturday, 18 August, with the March of the Clowns. Organise! is designed to equip the hearts, heads and hands of communities, individuals and institutions. The four movements of the Consultation are orchestrated by four questions: Where does it hurt? What are the roads to organising from below? How do we get there? How do we feast in the city? Elements of Organise! include devotional reflections, panel discussions, round-table conversations, workshops, vision walks, keynote speakers, collective laments, creative spaces, pathways for sharing resources, and the March of the Clowns. We are called to bring laughter in a sad world, but also to cry about and resist that which makes the world sad! Together, we will revisit our personal, communal and institutional roles in building concrete signs of justice and reconciliation in particular places.